Next to the Prado and Thyssen-Bornemisza Museum, Reina Sofía, CaixaForum and the Círculo de Bellas Artes. Cibeles, Las Cortes, Plaza Mayor and Sol. The District of the Letters takes its name in homage to the great writers who inhabited its streets in Century of Gold. Cervantes, Quevedo or Lope de Vega ... The charm of its pedestrian streets and its many shops and restaurants make it especially lively, yet elegant and without excessive noise. The building is from the late nineteenth century renovated and with elevator. Very cozy and quiet. 88 m² Recently renovated, it opens as a tourist accommodation. The flat consists of two bedrooms en suite with full baths, one with bath and one with shower. Full kitchen. Spacious living room. It is elegant, comfortable and quiet. The sofa bed is 1. 30m easy to open and available upon request. I offer coffee capsules, tea, infusions, Cola Cao, juices, milk, sugar, buns and sweets ... everything you need for a good breakfast. If you want, I can pick you up and take you to the airport or station. Give them the directions you need from the city. Help you with public transport. Recommend restaurants, shops, shows. Count on me for what you need. I will leave maps of the city, the transports and the most important points of interest. You will find reading about the most relevant attractions of Madrid and other Spanish cities. There is a map of the world in which the guests leave a record of their country of origin and a map of the area so that you locate the points of interest without problem. The building is very beautiful inside and out, S XIX but renovated and with elevator, although it maintains the flavor of its era. It is a quiet neighbors community, so you have to avoid noisy events. You will find the written instructions, the key WIFI (optical fiber), operation of the electrical appliances, etc. Anyway, there is a doorman who can lend a hand if you need. The District of the Letters takes its name in homage to the great writers who inhabited its streets in Century of Gold. Cervantes, Quevedo or Lope de Vega passed through this area between the Paseo del Prado and the Plaza de Santa Ana, one of the most popular in Madrid because of the charm of its pedestrian streets and its many shops and restaurants that make it especially lively. weekends. From the Plaza de Santa Ana, famous for its terraces and tapas bars, streets like the one in Huertas, whose cobblestones are engraved by great writers in Castilian, slope down to the Paseo del Prado. It is precisely in Lope de Vega Street, in the church of San Ildefonso (Convent of the Barefoot Trinitarians), a commemorative plaque remembers that in an undetermined place of the building rests the remains of the author of The Ingenious Hidalgo Don Quixote de la Mancha, Miguel de Cervantes. Not far from there we find the house-museum of the great playwright Lope de Vega - curiously on Cervantes Street - which is also buried in the neighborhood, in the church of San Sebastián (Calle Atocha). One of the favorite quotes from the regulars is the Frog Market. On the first Saturday of each month, local merchants take their products to the streets, decorate their windows and offer special promotions, while concerts and street theater enliven the atmosphere. It is surrounded by restaurants, taverns and cafés of the most pleasant. The nearest train station is Atocha, less than 10 min. walking. The express bus from the airport stops at Cibeles, 5 min. The area is restricted access for vehicles (residents only), but you can leave the car in the parking of Las Cortes, 1 min. walking. Wonderful apartment- great location and everything we needed! Thank you, Sol, for a fantastic place to stay! The apartment was neat and clean, nicely decorated, and very convenient to the places we wanted to visit in Madrid. Despite its proximity to museums and the metro, the apartment was on a quiet street that felt very safe. It was nice to put the kids to bed and be able to sit up and relax with my husband. It was also really nice to have two full sized bathrooms and a washing machine for our family - often rare in Europe! The recommendations for activities were full of great ideas, especially the list Sol sent us ahead of time for things to do with the kids in Madrid (parks, family fun, low cost activities, etc). Sol was very responsive when we had questions and answered our messages promptly. I look forward to returning in the future, and would highly recommend this charming apartment! I don’t think the location can be improved upon. You are in the absolute middle of old Madrid surrounded by inviting comfortable tapas bars. 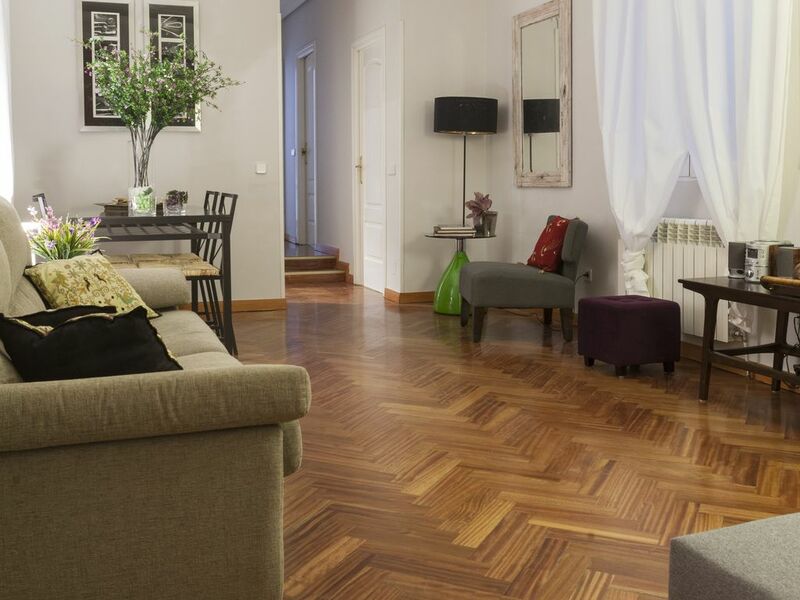 On foot, you are mere minutes from Retiro Park, the Prado, Puerto del Sol and Plaza Mayor. The apartment itself is very clean and comfortable. The hostess was easily accessible and very helpful with grocery shopping, subway tickets and restaurant suggestions. When I return, I hope I ca stay again. Thanks Sol! Pasamos 20 días increíbles! El apartamento es super cómodo, bien ubicado y por sobre todo, Sol su propietaria es una gran anfitriona y gran persona. Lo que recomiendo al 100%. Un apartamento muy confortable, con todos los detalles necesarios para disfrutar tanto dentro como fuera del piso. Muy céntrico y totalmente recomendable. Y muy bien atendidos. Lovely spacious 2 bed apartment with 2 good sized bathrooms. It has all the comforts of home as well as being in a great location. We found it to be quiet at night, easy to get a good night sleep. But even better than the apartment is Sol's excellent communication, help and care. Property manager Antonia was also very helpful. If we were to return to Madrid we would love to stay here again. No hesitation in recommending this apartment. This apartment was in a perfect location near The Prado. It was very generous size with 2 bedrooms and 2 bathrooms and nice kitchen. Immaculate condition. It was very much a home away from home. I will definitely come back!